User interacts with the native core. 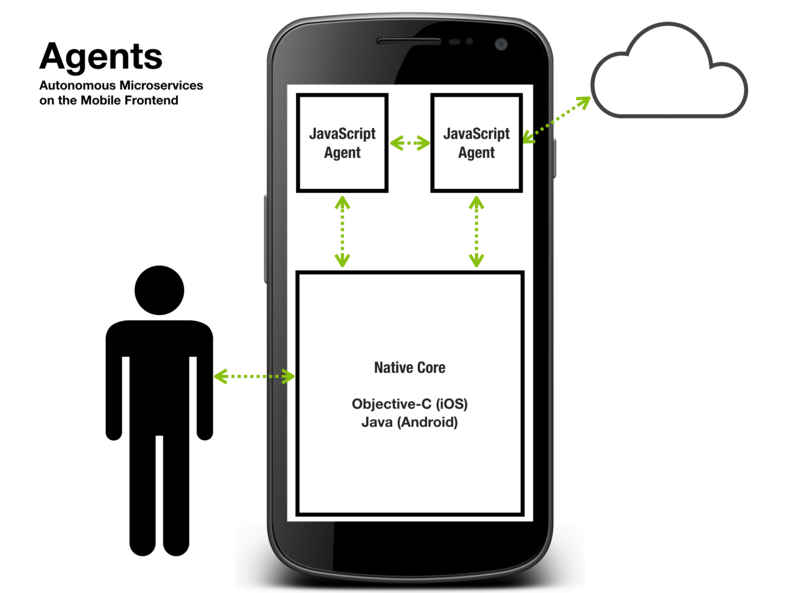 Core and Agents communicate through JSON-RPC. In short, it's like microservices, but on the frontend. 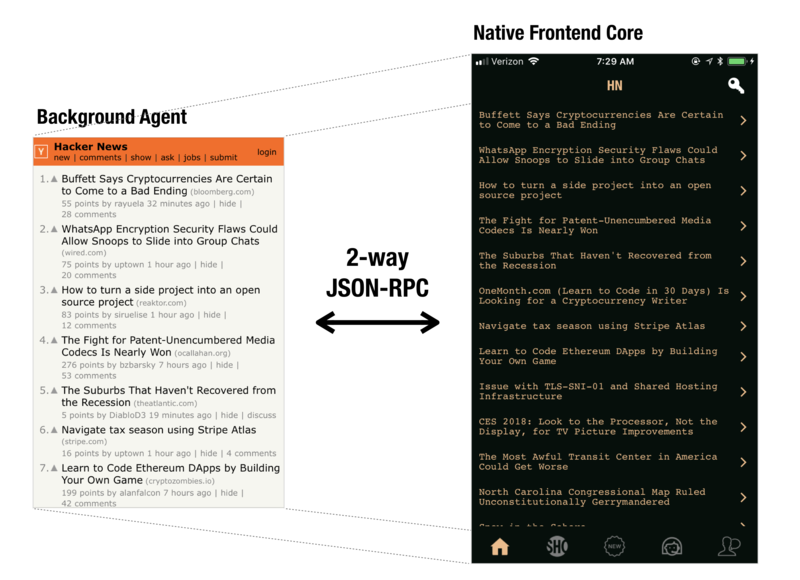 Agents are optimized to run in the background (Users never interact directly with agents) and interact with the core native app engine with JSON-RPC. Since Jasonette is already 100% operated with JSON, the JSON-RPC approach blends into the app seamlessly. In fact, if you already have a web app running, you can even plug it into Jasonette as an agent and make it work as a "backend" to Jasonette's native frontend. Above code basically lets you import the site as a Jasonette agent and communicate with it through JSON-RPC going forward. In the demo you can only see the native app UI on the phone, but in the background the same web app is running to communicate with Jasonette. But let's not forget, Jasonette is ultimately a native app platform. All the user interactions happen on the native core side. Agents run in the background and run tasks for core. And here's the cool part: There can be multiple agents. This means agents bring multithreading to Jasonette. Jasonette core is single threaded in order to ensure deterministic UI behaviors. This made it impossible to run multiple concurrent tasks on Jasonette. With agents, all you need to do is offload all the tasks to agents and let them report back through events. An agent is nothing more than a web page. We have declared a function called md5 which takes two parameters data and sync. The md5 function runs some task (CryptoJS task) and then makes an $agent.response() call. This is where the agent will return the result back to Jasonette. We'll see this below. Now that we have an agent. How do we plug it into Jasonette? All you need to do is declare the URL under $jason.head.agents. We have named this agent "crypto", and enter the url. We will use this as the id when making JSON-RPC requests. In this case we used a file:// url scheme, but you can also load a remote agent with an http[s]:// scheme. Now let's actually make a function call into the md5 function from the agent. Below is the JSON action that wil make a JSON-RPC call to the agent. The $agent.request is the Jasonette action that makes agent JSON-RPC calls, and the options object is the actual JSON-RPC request object. Remember the how the md5 function from above? The JSON-RPC object is basically saying "find an agent with an id of 'crypto', ask the agent to run a function called 'md5' with the two parameters." 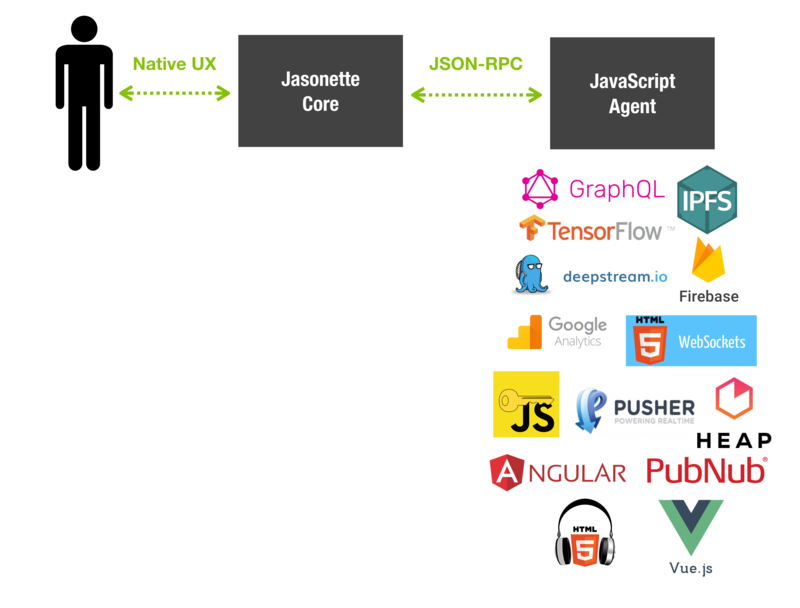 When the function finishes running, this $agent.response will trigger the success callback on the Jasonette core side, and now Jasonette will continue executing rest of the action call chain. This was just a quick tutorial, but there are other powerful methods that let you create and communicate with agents flexibly. Check out the documentation to learn more. Excited? Take a look at some functional examples!